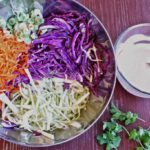 Coleslaw is a classic cookout side dish you can easily adapt by adding your favorite seasonings or herbs. My spicy chipotle version uses fresh lime juice for acid and honey to sweeten the dressing. Instead of the traditional vinegar and white sugar. If you aren’t a cilantro fan, substitute fresh chopped Italian parsley instead. To make life easier you can even use a pre-shredded coleslaw mix. This tangy 10-ingredient Spicy Chipotle Coleslaw recipe is more than a great side dish though. It’s also delicious on top of sandwiches and tacos made with my Crock Pot Pulled Pork! Don’t be afraid to pair it with fish or chicken either. It’s a fresh, versatile recipe you can enjoy with a variety of dishes. Chipotle peppers in adobo sauce are a pantry stable around here. We add them to everything from scrambled eggs for breakfast to salad dressings like my favorite Creamy Chipotle Lime Dressing. Their smokey, slightly spicy flavor is completely addictive! Don’t worry about them being too spicy though. Use the peppers themselves for more heat, or stick with just the adobo sauce for a more mild taste. 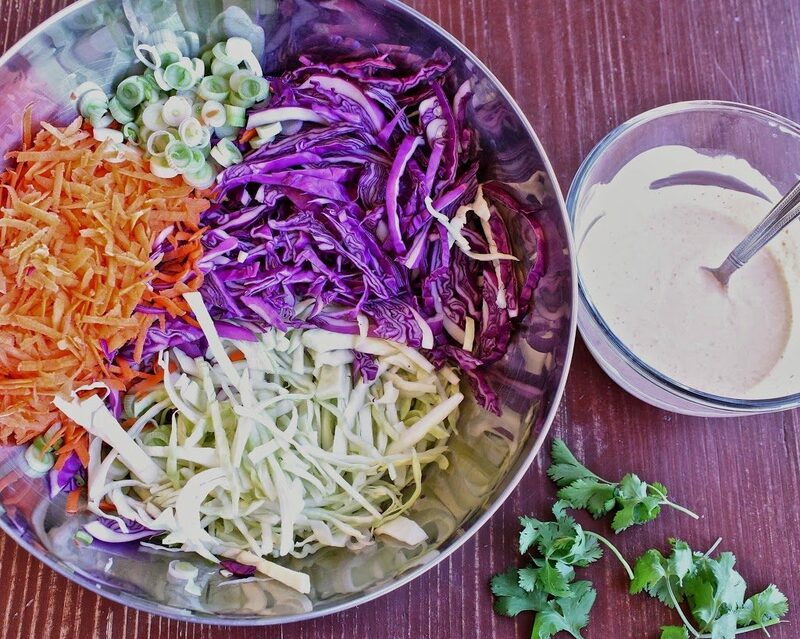 I hope you like this Spicy Chipotle Coleslaw side dish as much as my crew does. If you want more cookout friendly recipes, you can find more like it by checking out my Side Dish section! For recipe inspiration delivered to your inbox, subscribe to my newsletter, follow my photography journey on Instagram, and for generally inappropriate humor follow like me on Facebook! In an extra large bowl whisk together sour cream, mayonnaise, lime juice, chipotle peppers, and honey. Salt and pepper to taste. Add shredded cabbage, carrots, and scallions to bowl. Toss to coat completely. Refrigerate at least 20 minutes or overnight. Mix chopped cilantro into coleslaw right before serving.